One of the world's greatest cycling challenges is coming to Northern Ireland, and it's live on BBC2 NI. The Giro d'Italia starts in Belfast and BBC NI will follow every high speed twist and turn as some of the world's top cyclists negotiate three stages. The first programme on Friday 9 May, starting at 18:30 BST, will have coverage of the Team Time Trial. There's live action from Stage 2 on Saturday at 14:00 and Stage 3 on Sunday from 14:30. Once the event leaves these shores you can follow the event on BBC Northern Ireland with daily stage highlights on the BBC Sport NI website as the race for the famous pink jersey continues in its home country, Italy. BBC Sport's Jill Douglas, who has presented cycling at the Olympics and Commonwealth Games, will front three live programmes on BBC Two Northern Ireland, with BBC Sport NI's roving reporter Gavin Andrews capturing all the excitement, colour and atmosphere as the peloton criss-crosses Northern Ireland and the Republic of Ireland. The first programme on Friday 9 May will have live coverage of the opening Team Time Trial as the Giro d'Italia starts from Belfast's Titanic Quarter, welcoming a host of international stars of the sport including Colombian Nairo Quintana, German Marcel Kittel and Australian Cadel Evans. Cycling fans will be able to cheer on their local favourites as Dublin rider Nicolas Roche, son of former Giro d'Italia winner Stephen Roche, takes to the roads alongside his cousin Dan Martin and Donegal cyclist Philip Deignan. 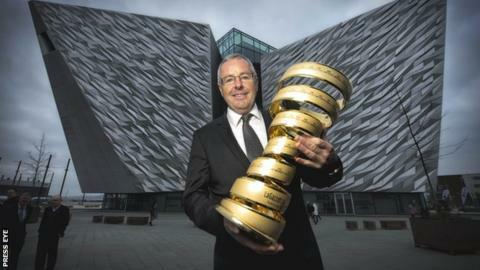 Giro d'Italia Live brings viewers the afternoon sessions of Stage Two on Saturday 10 May, following the riders as they speed along the picturesque north coast and Glens of Antrim to the sprint finish at Belfast City Hall. On Friday and Saturday, Jill will be joined in studio by Michael Hutchinson, former British professional cyclist. On Sunday 11 May the coverage follows the riders as the Giro d'Italia leaves Northern Ireland to head south and a sprint finish in Dublin. As well as the live action, the programme will bring you all the colour from the peloton's visit earlier in the day to County Armagh. The weekend's coverage will also include route previews and packages explaining all there is to know about the Giro d'Italia including the intricacies of Team Time Trailing and road racing. "The BBC is delighted to be able to bring the spectacle and excitement of this major international cycling event to audiences throughout Northern Ireland," said Peter Johnston, Director BBCNI. "There has been lots of interest in and build up to the Giro D'Italia in recent weeks and it is great news, with the help of the Northern Ireland Tourist Board, to have secured the broadcast rights which will now make the event even more accessible through our live coverage across the three days on BBC Two NI." Enterprise, Trade and Investment Minister Arlene Foster said: "Anticipation is high as we prepare to host over 200 top professional cyclists from across the globe, who will push themselves to the limit as they battle to earn the right to wear the coveted pink jersey. "The Giro d'Italia is a world class sporting event - but it is also so much more. It brings with it colour, passion and an atmosphere all of its own and it is great news that BBC Northern Ireland will be at the heart of the event to broadcast the action live." Giro d'Italia Live is a Century TV production for BBC Northern Ireland.